Well, we are on the home run. Only one more night before we leave Tasmania. We are up late at 8:30 am and leave Swimcart Beach at 9:45 am. We head north along the coast. There is another camping area at Cozy Corner that is very nice. At Seatons Cove there is a very small camping area in a picturesque cove with three houses. Sloop Reef has space for about six cars. After Big Lagoon Road there is another road to the left signposted Fire Road and Ansons Bay. We go straight ahead to the small village of The Gardens. Very nice, but no camping. We go back to the intersection and head towards Ansons Bay. This passes through a forest and the gravel road is in good condition. When we hit the "main road" to Ansons Bay we turn right and a bit further on we come to a three way intersection. We take the road to the right which is not signposted. This goes to Policemans Point. We get there at 11:00 am. There is a very large and spread out camping area here which would be a very nice spot to stay. 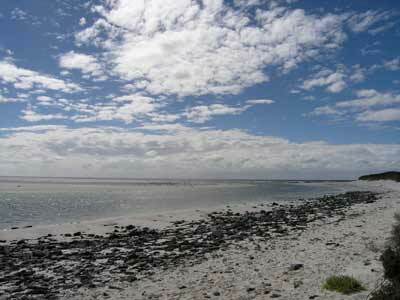 We have morning tea here while we walk to the channel that leads out from the lagoon to the ocean. There is a large sailing catamaran in the lagoon closer to Ansons Bay and it is hard to see how it got into the lagoon as the channel and bar are very shallow (it is low tide so there would be a lot more water at high tide, but it would be hairy). At 11:25 am after morning tea we go back to the three way intersection and travel out to Eddystone Point in Mount William National Park. 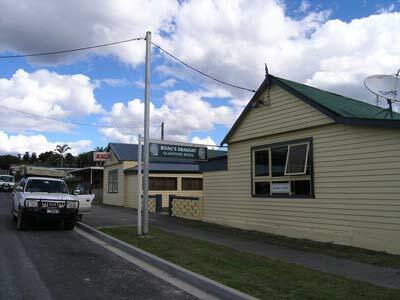 We do not go into Ansons Bay as this very small village is off the main road a few hundred metres. We arrive at Eddystone Point at 11:55 am. It is a cool 18ºC with some clouds but a lot of sun and a medium strength southerly wind. 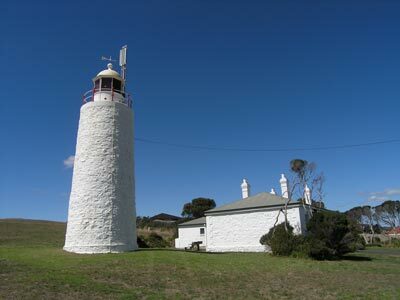 This is a very nice spot, with a lighthouse built in 1889. 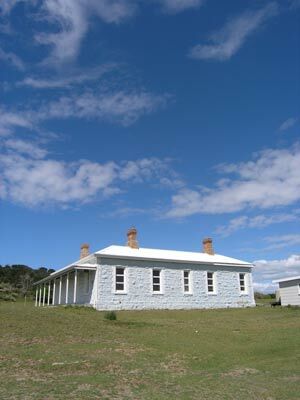 There are three light keeper buildings which are leased to the local Aboriginal group. It is not clear if you can rent them for a holiday. I decide to go for a dive in the bay adjacent to the boat ramp. Kelly decides against diving as she again has a head cold. 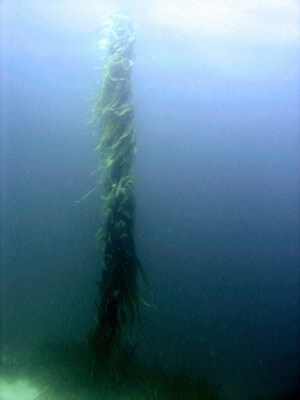 The dive site is very shallow, with lots of large kelp and many large abalone. The depth finally gets to about 10 metres and there are lots of fish about. Click here to read more about the dive. After the dive we have lunch and at 2:00 pm we leave. 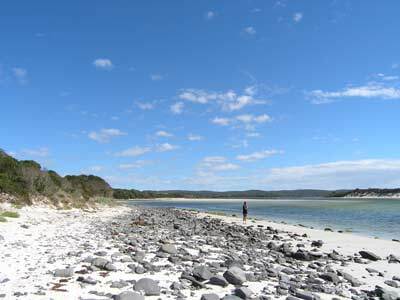 We backtrack to the main road to Gladstone and about 15 kilometres on we turn right to go to Musselroe Point. It is 47 kilometres from Eddystone Point to here and we arrive at 2:50 pm. 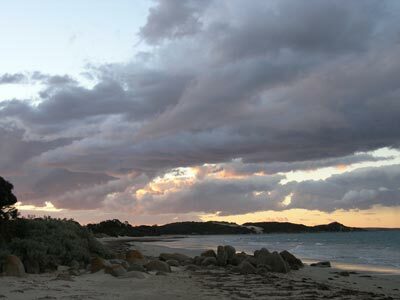 This is a small village which appears to be called Poole or Musselroe Bay, depends on what signs you believe. Anyway, it is a fishing village and no shops at all. The camping area is on the lagoon and not the best. This spot is probably the north-eastern corner of the Tasmanian mainland (Lyme Regis may also lay claim). We head back towards Gladstone (there are at least five Gladstones in Australia) and arrive there at about 3:10 pm. This has a few shops and a petrol station. We need some petrol to get us back to Devonport and then onto the suburbs of Melbourne so we can get cheaper petrol (it will be at least 20 cents a litre cheaper than here - say $24 saving). I put in $68 of fuel at $1.54 a litre (the most expensive of the trip). There is a nice pub here so we go and have a beer. We chat to the publican and learn of her trip to the Devonport Cup race meeting yesterday. Sounds like a great time was had by all who went. After the beer we leave at 3:45 pm and head west towards Bridport. 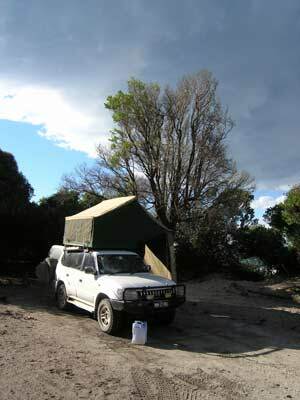 We are not going all the way as I want to camp at Waterhouse Point in the Waterhouse Conservation Area. I am not really sure what this will be like so it is a bit of a risk (I cannot find any information about it). 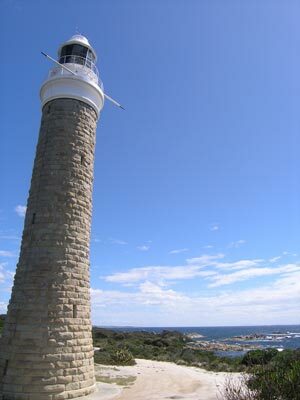 It is 37 kilometres to the turn off to Waterhouse Point and we actually go straight past as there is no sign at all. I only realise that we have missed the turn when the GPS shows that we should be heading north. We back track a few hundred metres and take the road that we noticed. Pitiful that there are no signs advertising the area. Anyway, it is about 10 kilometres out to the water. Along the road we find a fallen banksia and I cut some timber for our fire tonight. As we have no idea what to find, we take the track to Mathers Camping Area which is before you get to the point. This is very nice but all the best spots are taken by more semi-permanent caravans and other campers. We head to Village Green Camping Area and find a very nice spot right on the water's edge. However, as we start setting up our camp, the flies drive us crazy. No way are we staying here. We go back to the beach near Mathers and check out some unnamed spots near here. However, again, all the best spots are taken by semi-permanent caravans. We went back to the main road in and headed to the Waterhouse Point Camping Areas. We try some more camping areas (there are many, all running off a main track behind the beach) but find a similar situation to the other spots. Finally, we end up at Casuarina Hill Camping Area. This is right behind the beach. There is no-one here and we get the prime spot. We set up camp at 5:30 pm. 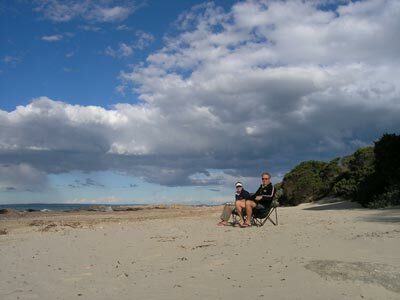 We take our chairs down to the beach and eat cheese and biscuits and biscuits while we drink beer and sparkling wine. It really does not get much better than this. I get the fire going and Kelly cooks us a Thai green curry. We are a bit short on chicken so we end up having chicken and frankfurts in the curry. Very nice as it turns out. Afterwards, we sit drinking and I cook my apple crusty pudding. We end up finishing all the wine, port, two bottles of sparkling wine and five beers. Needless to say, we are both hazy about what time we went to bed. The last day in Tasmania. Due to last night's celebrations, we are both feeling very average and we do not get out of bed till 9:35 am. It is already very warm, 19ºC. We leave at 10:35 am (see how long it took us to pack up). We still have a bit over 200 kilometres to go to reach Devonport but it is nearly all on good roads so we do not need to rush too much. On the way I want to look at Bridport as well as George Town and Beaconsfield. We have a look around Bridport. This is quite a big town and has a boat building business on the waterfront. There are some very large boats (small ships) here and all of the fishing boats are sitting on the dry sand. 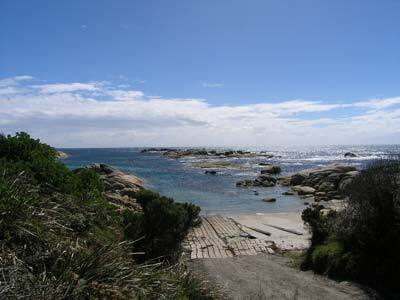 There is less than 20 cm of water in the channel leading to Bass Strait so it looks impossible to get a boat in or out. However, there are very large three metre tides here so at high tide you obviously can navigate safely in and out. From here we head to Bellingham and Beechford which are both off the highway. Both are small fishing villages, with very few houses permanently occupied. At Beechford there is a small picnic and camping area. In this area there has been a very severe bushfire. I remember that about two weeks before we left Sydney (that is, about six weeks ago) there were a number of large bushfires in Tasmania. This must have been one of them. The bush and plantation forests are burnt for well over 10 kilometres. From Beechworth we head on a gravel road to George Town. We go to Low Head (1:00 pm) which is at the western side of the entrance to the Tamar River (which is about to be ruined by the pulp mill which will soon be constructed nearby). This is a fascinating place. There is an old pilot station here where the crew of the pilot boats lived. They had to guide ships entering the Tamar River as there are dangerous rocks off shore. 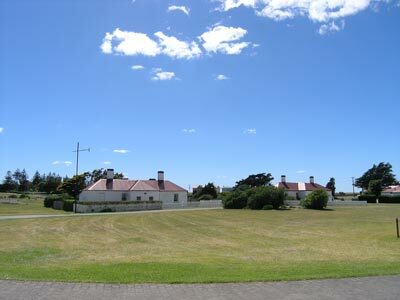 The pilot station has numerous restored buildings, including many accommodation houses that can be rented out. We have lunch in the cafe, not the greatest choice of meals, but something greasy settles our stomachs. There is also a museum here but we do not have time to visit it. After lunch we have a quick look around and run into Gary and Sue who we first saw almost three weeks ago at Macquarie Heads. After a quick chat with them, we go to the lighthouse. 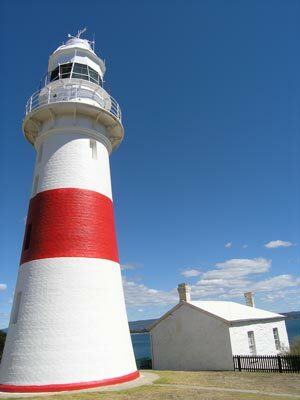 The lighthouse is right on the point and back towards the pilot station there are a few historic houses as well as lead lights (used to line up when entering and exiting the river) as well as a reconstruction of the semaphore station that was used to send messages to Launceston. There is also a nice picnic area here as well. As mentioned, I want to stop at Beaconsfield to see the town and mine which gathered so much national and international headlines in 2006 when the trapped miners Brant Webb and Todd Russell spent 14 days underground before being rescued. In this accident on Anzac Day, 25 April 2006, Larry Knight was killed while they were operating a mine machine to expand the gold mine. I often think about how his death has almost been forgotten in the media attention given to the rescue of the other two miners. We leave Low Heads at 2:40 pm and at 3:00 pm we arrive at the Batman Bridge. This is not, as some may imagine, named after the Caped Crusader, but John Batman, the founder of Melbourne. 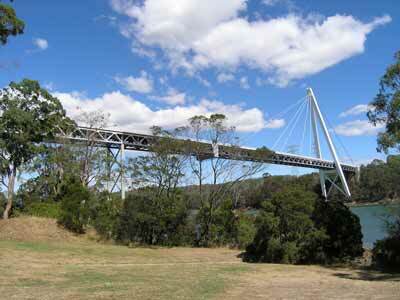 I do not know how this bridge came to be named after him, but obviously he has something to do with the area. This is a very high bridge as large ships have to be able to pass under it as they travel up the Tamar River to the aluminium refinery and other places. Sue and Gary, who we had seen again earlier, told us that they were camped under the bridge. We expected that this was a small spot that they had chanced on, but when we arrive we see that there is a very large grassed area on the eastern side of the river. There are quite a few caravans and campers here and it looks like a good spot to camp. There are toilets here as well. From here we head to Beaconsfield and get there at 3:20 pm. We stop at the mine and look at the existing mine buildings. 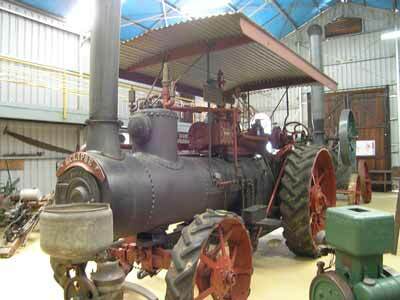 We then go into the Grubb Shaft Mine Museum. 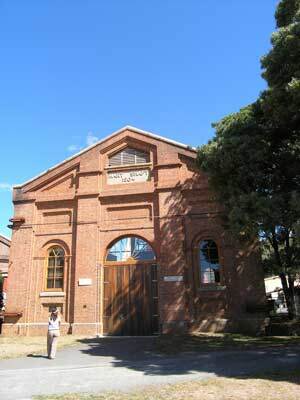 This is an excellent museum based in the buildings of the now disused mine. 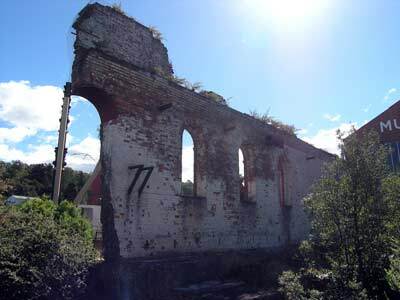 It covers the mining history of the area as well as general history. One thing I found disappointing was that the most famous incident to occur in the town and mine's history was not even mentioned. This is an oversight that the museum should address. Anyway, the museum has some interesting things, including a walking water race that powers a water wheel and crushing machine. Excellent! 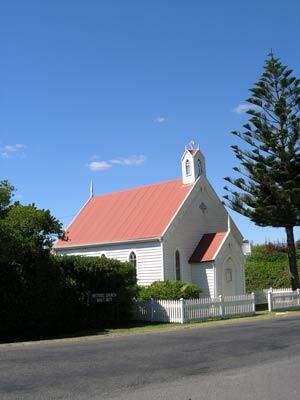 We leave at 4:30 pm and travel to Devonport where we arrive at about 5:15 pm. We are on the overnight trip to Melbourne and have a cabin. We decide to eat dinner in town before boarding the ferry. We decide to get some takeaway Chinese from a place in King Street and eat it on the waterfront opposite the ferry terminal. The food is only average, but not too bad. We arrive at the terminal at 6:30 pm and are on the ferry (Tassie II - the same boat we came over on) by about 7:00 pm. We have booked a cabin at a cost of $378 (plus car at $121) but with a discount of about $31. We go to our cabin and have a quick shower before go to the bar on Level 10. The ferry leaves right on time at 8:00 pm and we have a couple of drinks before going to bed at about 9:00 pm. Even once we are out in Bass Strait you would hardly know that we are on a ship, as it is absolutely calm and the boat is very quite. We sleep very well. At 5:15 am a wake up call comes over the ship's public address system and we get up and have a shower. We arrive back at the wharf in Melbourne at 6 am after a smooth crossing of Bass Strait. It does not take too long to get off the boat and at 6:20 am we leave the wharf area. We head off north through the centre of the City and in Lygon Street we stop at McDonalds and get have some breakfast. We leave at 7:00 am. It is still dark and cool at 11ºC. We go to the Woolworths Petrol at Prestons and get $178 worth. At 7:20 am after refuelling, we set the cruise control and follow the Hume Highway north to Sydney. We stop for morning tea at a rest area north of Benalla at 9:25 am. We leave 10 minutes later and stop for lunch at Tarcutta at 12:05 pm. We leave at 12:25 pm and head straight home, only stopping quickly a couple of times for driver changes and rest stops. We arrive home back in Tempe at 4:50 pm. We have travelled 5,163 kilometres in the past 29 days. This is about 600 kilometres more than I had originally calculated. We have seen a lot of Tasmania, all of it great. There is still so much to see and we did not spend as much time as we would have liked in some of the places. I reckon that a minimum of two months is needed to see the place, with three months really enabling you to relax and cover everything. Highly recommended, one of the best holidays we have ever had. This works out at $553 each per week, a pretty good and cheap holiday. Of course, staying longer would reduce the cost per week considerably. Fuel economy was 14.5 litres per 100 kilometres (19.5 mpg).